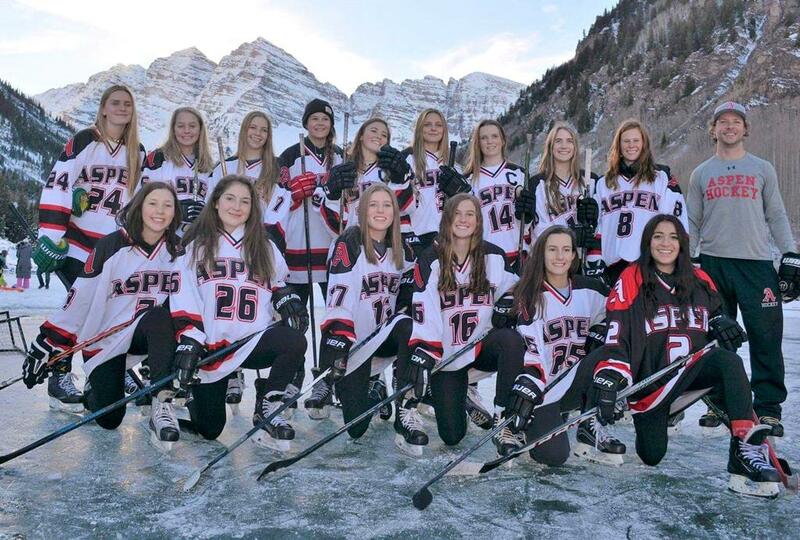 The Aspen 19U Girls clinched the regular season MSGHL title with an impressive undefeated 17-0-1 first place record. Fueling their game is a commitment to a possession and a stretch-the-ice philosophy, led by Head Coach Kirk Golden and long-time veteran coach Keith Howie. Honestly if you tracked puck possession statistics, the numbers would be staggering; this is a fun team to watch. In their final league weekend series, Aspen faced third place Summit on the road in Breckenridge for a pair of Saturday games. Missing standout defenseman Charlotte Howie and league-leading goaltender Sammie Jaworski to the flu, the team relied on a three-player defensive rotation and the services of 15U Leafs goaltender Linnea Earl in net. In game one, prior to the puck drop, Aspen participated in an on-ice ceremony that honored 9 Summit Seniors. Coming off the emotion of that event, the Lightning capitalized on their first shift for an early 1-0 lead. Aspen quickly settled in and began dominating play. After trading goals to finish the period (a Livi Carr goal), Aspen simply took over outshooting Summit 18-3 in the second period. Laney Martens and Hayley Heinecken made it 3-2 heading into the third. Just over five minutes into the final stanza, team captain Katie Yocum gave Aspen breathing room scoring her 17th point of the season. She netted an empty net goal to solidify the 5-2 victory with just over 90 seconds left in the game. After giving up two first period goals, goaltender Linnea Earl found her comfort zone and stood tall stopping all 8 shots in the second and third periods. In game two, Earl was handed the game puck following her first 19U shutout performance. With the team goal of an undefeated season on the line, Aspen responded like warriors with a perfect final game. Outshooting the Lightning in the first period 17-4, Aspen asserted its dominance from the drop of the puck. After peppering the Summit net-minder with shots, just over seven minutes into the contest Katie Yocum and Hayley Heinecken both found the back of the net, scoring back-to-back goals on the same shift for an early 2-0 lead. The team held Summit to only two shots in the second period, and added to its lead when senior defenseman Kaelin Harris tallied a power play goal. In the third period, Aspen increased its intensity smelling the success of regular season perfection. They fired off 13 more shots, and Earl played like a veteran making five timely saves. Fittingly the team’s leading scorer Casey Chesner (24 points) finished the regular season scoring, netting her 13th league goal early in the third period to take a commanding (and final) 4-0 lead. In total, Aspen finished league and tournament play with an overall 21-0-1 record, claiming the MSGHL regular season championship and the Steamboat Adele Divas 2018 championship title. In the December tournament, Aspen outscored its opponents 19-2 in four games. During the first week of practice in October, the team set the goal of finishing first in the MSGHL with an undefeated record. Achieving that goal was nothing short of special. The team will celebrate and quickly turn the page to begin preparations for the upcoming MSGHL/State championship in Denver February 22-24. Entering the playoff tournament as the top seed, Aspen also begins play as the 2018 defending champs. They will face five top MSGHL teams, including the Lady Roughriders, who are the only team to blemish Aspen’s record, a 2-2 tie at Lewis Arena back on December 1. The only loss the Lady Rougriders suffered was a 2-0 defeat in Aspen December 2; they have rolled through the competition since. Fielding top players from the north Denver suburbs, Fort Collins and Boulder, they lead the league with an impressive 115 goals (Aspen was second with 85). Considered defensively dominant, the Lady Roughriders only gave up 10 goals the entire season. Aspen only allowed 12. It should be an epic matchup in the final tournament of the season.